Invisible Girlfriend and Invisible Boyfriend aren't the first apps that promise to be your virtual partner. But they might be the best apps that promise to trick your friends into thinking you're in a relationship when really you're just sad and lonely and watching too many of the Netflix and eating all the pizza. The best. How does it work—besides brilliantly? Well, after you download the gender-specific app, you pay the company money to send you messages and crowdsourced selfies. Then, you pretend these messages are from a real human and excuse yourself from real social interactions so that you can respond to your robotic lover. "Our inaugural service is $24.99 and includes 100 texts, 10 voicemails, and 1 handwritten note," co-founder Kyle Tabor told Betabeat. "We're looking to create both less and more expensive packages as we learn what our users need." 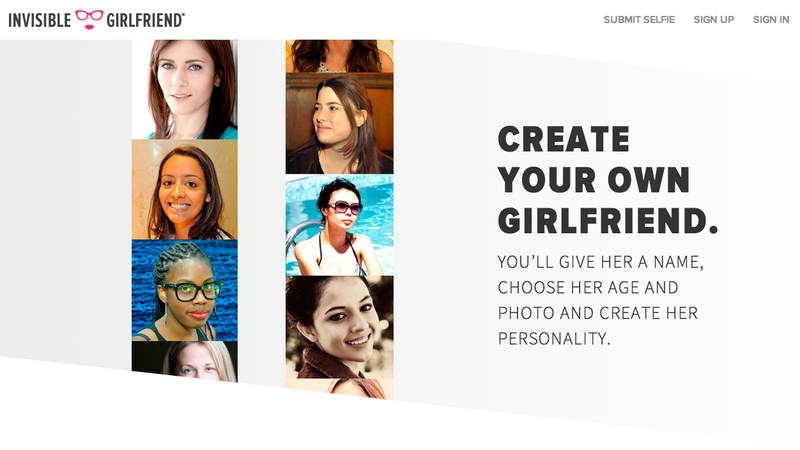 The St. Louis-based company started as a joke, after Tabor's co-founder Matthew Homann bought the invisiblegirlfriend and invisibleboyfriend domains nine years ago. Then, in 2009, the two entered the idea for corresponding apps in a local startup contest and won the damn thing. Now, the enterprising young businessmen say they've developed a "secret sauce" that makes all of the exchanges sound like real human interaction. The handwritten letter, we're guessing, does involve a real human.